Since its launch in 2004, Basecamp has grown to over 2.8 million accounts and rising… I think people are cottoning on to the number of ways it can help their business. In my role as Digital Editorial Assistant, I use Basecamp to communicate with international clients and manage multiple projects simultaneously. It keeps conversations nicely organised within each project thread and saves you having to check through hundreds of emails. I also love the way it keeps everyone in the loop; you can add as many people as you’d like to a project, therefore anyone can pick up where you left off! You can also get Basecamp for Android and iOS – with Basecamp on-the-go, 89% of users said they had a better handle on their business. And the innovative Basecamp developers are always adding new features… Enhancing the tool for creative businesses, one of this year’s updates included an image gallery where you can share images side-by-side within written posts, so if, for example, you’re presenting a Before and After of a design that’s been revised, you can now compare two images at once. Another new feature is ‘Profile Cards’. 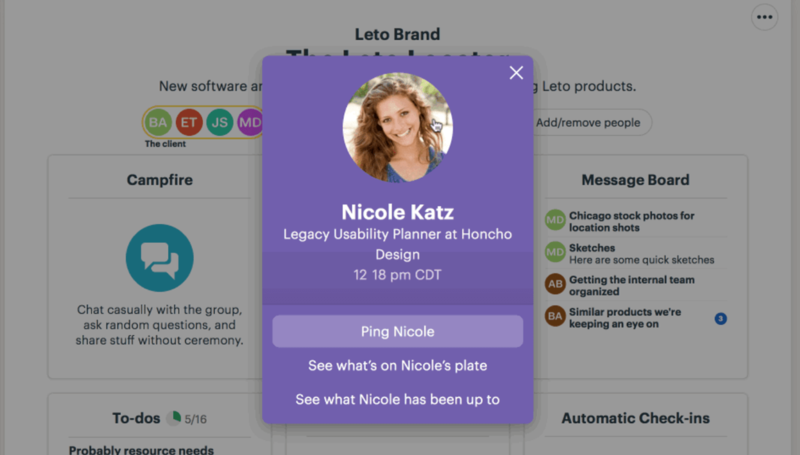 Clicking someone’s avatar in Basecamp is often the best way to get more information about the people you’re collaborating with – especially when you work with clients, people you’ve never met, or as part of a team covering different time zones. Now user profiles show you which company someone is a part of, their role in Basecamp (Administrator, Owner or Client) and the time of day where they are working. Pretty handy little feature! 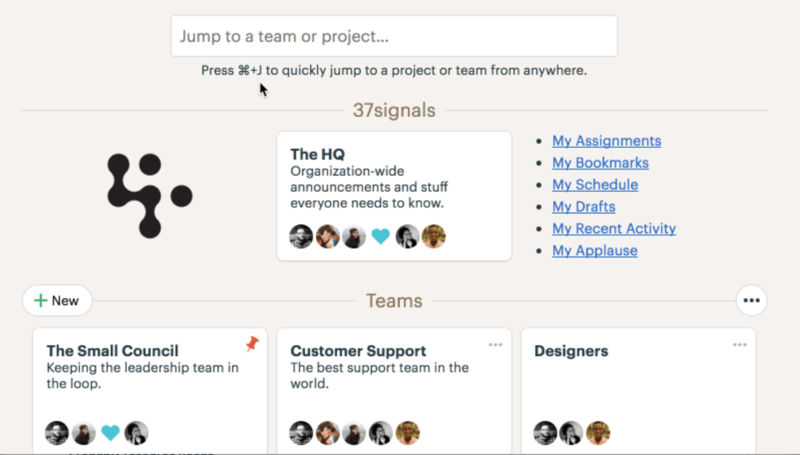 My personal favourite is the new ‘Jump to Projects’ element. 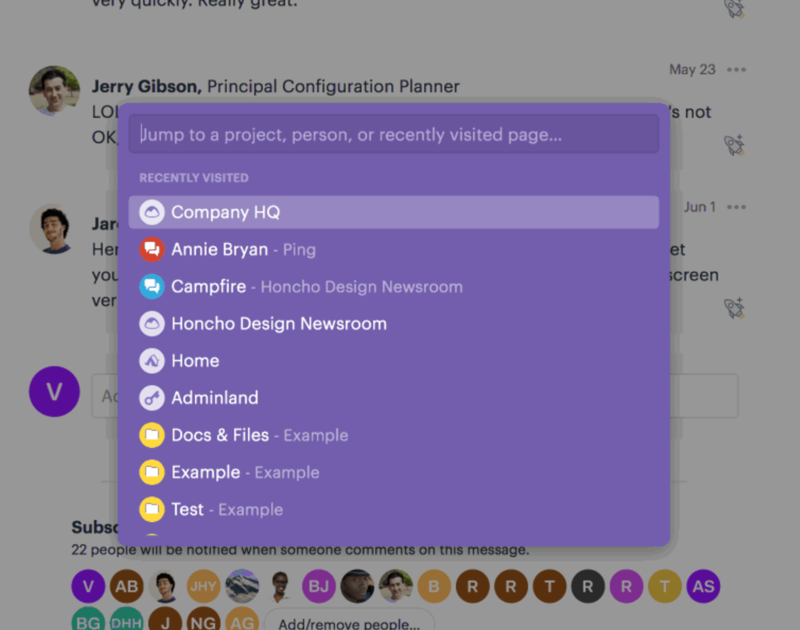 Only available for Basecamp Pro members, the Jump Menu is a speedy way to get around in Basecamp. Just hit ⌘+ J to return to something you saw recently or type a few characters to quickly filter Projects, Teams and People. The latest update has made it even easier to jump to another project by moving your most recent activity to the top of the list – making the Jump Menu the fastest and most efficient way to switch between projects. New to Basecamp? Why not give it go with their free trial. And for those seasoned Basecamp advocates, we’d love to hear if there any other features you love that help to improve your workflow and project management… tweet us @gmdesignltd.